A stellar vocal audition before they cut you off? It’s a challenge for even the seasoned auditioner! What makes a good audition spectacular — one that gets you noticed, gets you called back and ultimately gets you the part? 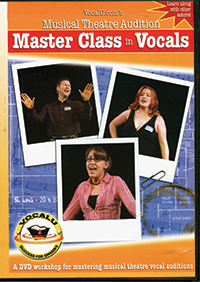 This first-of-its-kind DVD will help you nail the part you want with more than 90 minutes of tips, tricks and advice to master your vocal audition. You’ll learn how to choose the right song for the part, polished with vocal dynamics; show interesting characters in a short amount of time; and discover convincing body language to cement your stage presence. To help share all this advice, this DVD filmed a range of actors with different levels of experience as they auditioned before a panel of veteran casting staff. Read more...You’ll love hearing what these regular actors learned from the experts. The bonus material — a complete 25-minute audio audition guide for the beginning auditioner and a group Question & Answer session with the experts — is also packed with great advice to help you get answers to your questions.